Absence of antibodies to HTLV-III in health workers after hepatitis B vaccination. The African polio vaccine-acquired immune deficiency syndrome connection. Bridging the gap: human diploid cell strains and the origin of AIDS. Collective experiences of adventitious viruses of animal-derived raw materials and what can be done about them. Comparison of methods used for detection of mycoplasma contamination in cell cultures, sera, and live-virus vaccines. “Sir, Your News and Opinion articles about alleged contamination of vaccines should serve as a warning against over-optimism. These articles highlight the failure to show any evidence for contamination of Wistar Institute polio vaccine stocks by human and simian immunodeficiency viruses (HIV/SIV), and you appeal for a truce. 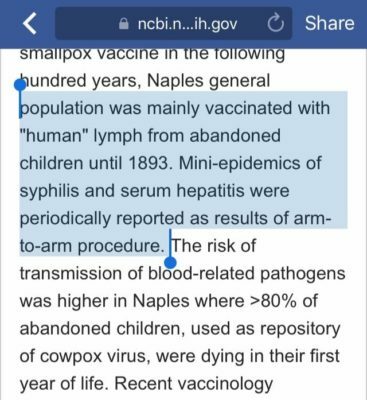 But — although Edward Hooper is quoted as saying that “vaccine samples released did not include any from batches prepared for use in Africa” — lymphocytes have been detected in other polio vaccines. Half of the vervet monkeys in Southern Africa are SIV positive; these animals were used for preparing early polio vaccines. Considering the many millions of vaccine doses prepared in primary vervet monkey kidney cultures over a 30-year period, it is inconceivable that some SIV did not contaminate many cultures. By the same yardstick, simian virus 40 (SV40) contaminated millions of doses of poliovirus vaccine until the animals were screened for this tumour virus. Experience with preparation an laboratory control of oral poliomyelitis vaccine in Czechoslovakia. 🛑 Experimental oral polio vaccines and acquired immune deficiency syndrome. The simian immunodeficiency virus (SIV) of the common chimpanzee is widely acknowledged as the direct ancestor of HIV-1. There is increasing historical evidence that during the late 1950s, kidneys were routinely excised from central African chimpanzees by scientists who were collaborating with the polio vaccine research of Dr Hilary Koprowski, and sent – inter alia – to vaccine-making laboratories in the USA and Africa, and to unspecified destinations in Belgium. While there is no direct evidence that cells from these kidneys were used as a substrate for growing Dr Koprowski’s oral polio vaccines, there is a startling coincidence between places in Africa where his CHAT vaccine was fed, and the first appearances in the world of HIV-1 group M and group-M-related AIDS. Because of the enormous implications of the hypothesis that AIDS may be an unintended iatrogenic (physician-caused) disease, it is almost inevitable that this theory will engender heated opposition from many of those in the scientific establishment, and those with vested interests. Hepatitis vaccine pluses outweigh threat of AIDS. Fraser B. Dent Stud. 1983. Investigation of a regulatory agency enquiry into potential porcine circovirus type 1 contamination of the human rotavirus vaccine, Rotarix: approach and outcome. Isolation and characterization of an adventitious avian leukosis virus isolated from commercial Marek’s disease vaccines. Live oral poliovirus vaccines and simian cytomegalovirus. 🛑 The origin of acquired immune deficiency syndrome: Can science afford to ignore it? Polio vaccines and the origin of AIDS. Should the risk of acquired immunodeficiency syndrome deter hepatitis B vaccination? A decision analysis. Simian cytomegalovirus and contamination of oral poliovirus vaccines. [SV40 as a possible cofactor in the etiopathogenesis of mesothelioma and other human tumors]. Testing for viral contaminants of veterinary vaccines in Hungary. Transmissible spongiform encephalopathies: vaccine issues.